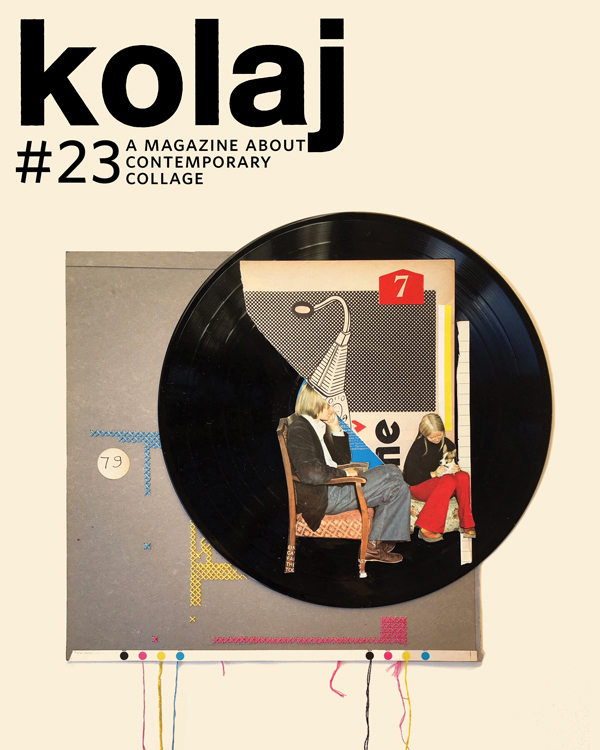 Kolaj #23 delivers a look at the wonderful world of contemporary collage: the people who make it and the people who love it. Unplugged by Rhed Fawell is on the cover. The collage was part of the Edinburgh Collage Collective’s show, “Vinylism”, at the Tent Gallery in Edinburgh, Scotland, 3-14 July 2018. All the works in the show were inspired by the vinyl record. 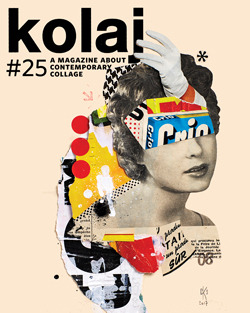 The story of how the collective is raising “A Tartan Collage Army” through open submissions appears in the issue. 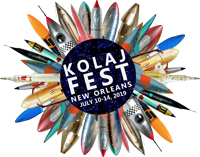 In our round-up of News & Notes from the world of collage, we report on an exhibition of large scale collage in Palo Alto, California; a show of Firelei Báez at Contemporary Arts Center in Cincinnati, Ohio; a new gallery in Hastings, England that has a heavy emphasis on collage; and an app by Italian collage artist Giuseppe Ragazzini that uses collage. In “Unbounded,” Etty Yaniv investigates the diverse interrelations between collage and drawing as manifested in the artworks of Ethan Murrow, Simonette Quamina, Simona Prives, Maria de Los Angeles, and Hugo Crosthwaite. We review a collage 101 by Holly Chastain: If You Can Cut, You Can Collage. The explanations of concepts like scale, rhythm, depth, which she acknowledges are straight out of art school, remind us that these attributes are useful to viewing collage critically. A new art fair is raising the profile of collage. Paper Positions, with editions in Berlin, Basel, and Munich, is putting collage front and center. We report on a selection of collage that was on view at the Basel edition in June 2018. Christy Mitchell’s collaged cigarette boxes hint at toxic masculinity. In “Smoke ‘em If You Got ‘em,” we review these curious three-dimensional works. Dale Copeland‘s International Collage Exhibition/Exchange comes to an end after twenty years. We offer this first-person account of this project that has seen the exchange of over 20,000 collages. The small format, firm backing, and ubiquitous availability make the playing card an ideal starting point for collage. We profile LuEllen Joy Giera‘s Monthly International Playing Card Exchange. 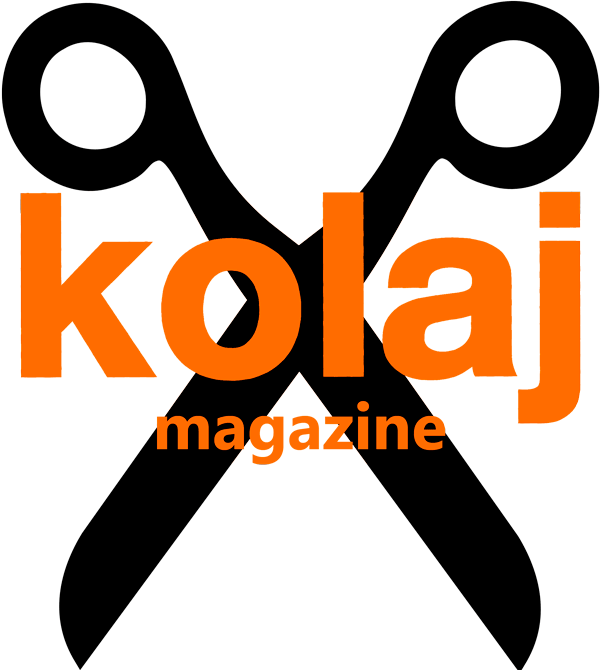 In Kolaj #23, Kolaj Magazine is pleased to announce the reintroduction of The Cut-Out Page. 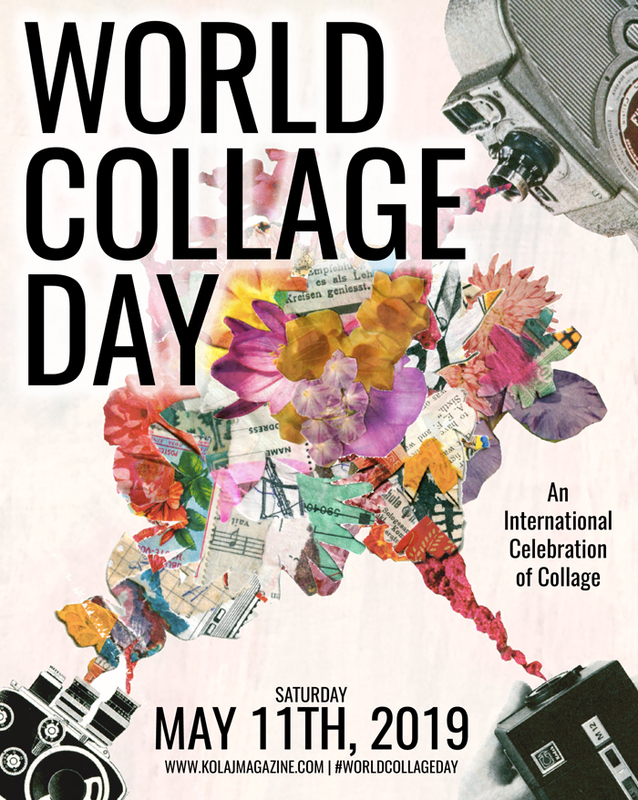 A staple of the first three years of the magazine, we retired the feature with Issue 12, but recently revived the concept when we invited collage artists to design cut out pages for the World Collage Day Special edition. The feature was not only popular, it was informative to see how artists selected and organized the fragments. We have decided to once again make The Cut-Out Page a regular feature of the magazine. This issue features a pink-themed page by Sue Guildford from Sandbach, Cheshire, United Kingdom. Already subscribed? Don’t worry, you will be receiving your copy by 15 August 2018.